Basically, everyone can cook. Most people, however, lack simple and straight forward instructions, some practice and routine. But when it comes to cooking for many some will reach their cooking limit quickly. With "Cooking for Many" you are in good hands. Here you find recipes for every level of difficulty. This gives even the beginner the chance to be successful right from the start. You will learn what you need, how to budget and how to calculate the required amounts easily. You will also learn about healthy eating, storage and handling of spices and what foods you can easily find in nature. Furthermore, here you will learn the most important thing about storage, hygiene, planning, purchasing and accounting. "Cooking for Many" even takes into account on how to involve children and young people into your cooking adventure. We show you how to motivate children. Even as young as kindergarten age. Eventually, cooking will be nothing but fun. For the beginner is it the easiest to start with simple meals. Especially when "Cooking for Many" simple meals are the best because it leaves more time for you to spend with your guests. Important: No matter what you are cooking be always watchful to use good and fresh ingredients only. Saving on the quality of ingredients is almost always saving at the wrong end. Another good idea is to buy, whenever possible, all your ingredients locally. The same applies to foods that are seasonally available only. Does it really have to be strawberries or other summer fruits in winter? Mostly they come from distant countries and are grown and harvested under questionable conditions. On top of that, they have to travel half around the world before they reach the supermarket shelves. No longer can they be called fresh. It does not have to be like that. – But there is also a thought regarding stopping the world hunger. Whenever we grow foods in another country, so that we, for example, can enjoy strawberries in winter, this means that this particular country cannot grow the food it needs to feed their own people. You will be surprised how many children indeed appreciate fresh and regional food. Just give it a try. Last but not least, if you have any ideas or recipes, which are not listed here, we are happy to hear from you. By constantly adding new and exciting content, this site will grow and be comprehensive at any time. "Cooking for Many" is no longer a problem. Anyone who spends a lot of time in the fresh air and does some exercise or activity gets hungry. This hunger needs to be satisfied. This fact makes it important that the food in the camp kitchen is always fresh and varied. Since there are a lot of kids coming together to a camp, it is important to respond to the needs of individuals. Whether this concerns allergies, or that some young people do not eat meat, those individual needs are different from person to person. Important however is, the food for young people is balanced to avoid any deficiencies. For an optimal development, young people, need lots of vitamins and a healthy ration of proteins and fats. As complicated as that sounds right now, it does not have to be that way. It is important that you choose recipes, which can be implemented for large groups. Therefore, it is not practical, if cooking takes too much time. The food should be tasty, expensive and easy to prepare. If the camp kitchen is supposed to cater for many children, there will be no time for three-course meals or similar things. It is important to teach young people tough, how easy it is to prepare food. This should be an interesting and informative activity, which does not require, spending all day in the kitchen with cooking and cleaning. The food, in general, should be easy to implement without requiring too much knowledge regarding the handling of it. There is also no point preparing meals with foods they don’t know and therefore don’t eat. The camp kitchen should always be adapted to its environment. Thus, putting mussels on the table. Chances are they will not eat them or at least not appreciate them. To put it in a nutshell, the camp kitchen should be as easy and uncomplicated as possible. 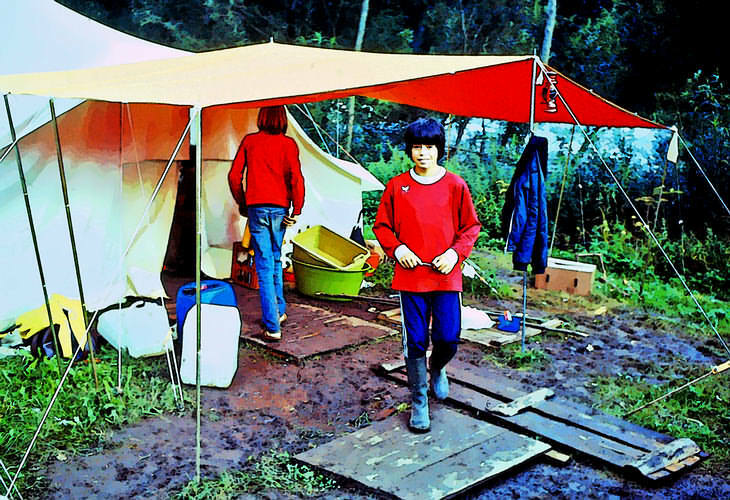 In addition to the planning and organisation of the program is an important point, but so is the preparation and planning of the camp kitchen. Where is the camp located? For how long will it go? How many people will be there? Who cooks and especially, what will be cooked? From the answer to all those questions quantity and material planning will result. 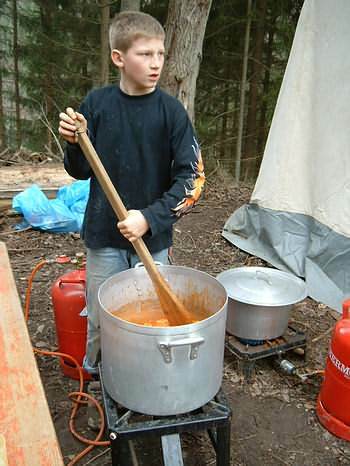 How can cooking become an integral part of the camp and yet, is a program point in itself? 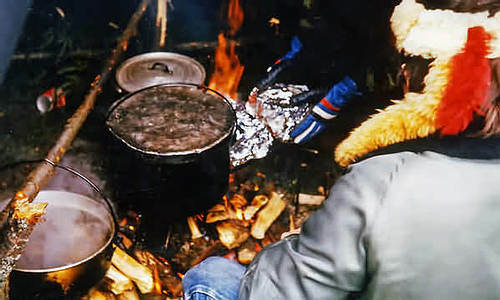 The type of camp has a huge influence on the menu planning and the way of cooking. Do I have a fully equipped kitchen with a refrigerator available, or do I have to carry it all to the campsite; or is this a walking adventure where we have to let go of most things and come by only with the minimum? The organisational effort with respect to the kitchen equipment is likely to be less in a reasonably well-equipped group house, then carrying it all with you to come up with a reasonable “field kitchen.” For example, if I have no fridge, how to I handle heat-sensitive foods such as sausages, cheese, butter, etc. Or do I have to coordinate my shopping and make different plans regarding quantities? If you are trekking with your youth group, you live more or less from the hand in your mouth. Stocking up food and carrying it with all the time is nearly impossible. Leave alone, keeping your food chilled. When trekking, you will need to rely more on bush food and foods from a can. For example, yoghurt has to be eaten immediately, and the waste disposed of accordingly. Carrying yoghurt with you bears the risk that it will pop open in your backpack.